When I was little, family holiday dinners were always at my great-grandma's house. She had a sturdy oak dining table that could be extended by the insertion of multiple leaves. In her tiny dining room, the long table had to be placed diagonally, and even then the table, chairs, and people barely fit. 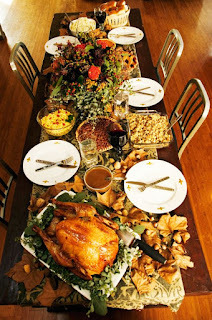 An overflow table (or two) used by random children and claustrophobic adults was placed in the living room. In addition to the turkey and some other dishes that Granny and her helpers prepared, most of the guests brought their own specialties. We could expect roast beef, green bean casserole, sweet potatoes, mashed potatoes, gravy, brussel sprouts, probably some other vegetables, a few different salads, a variety of cranberry sauces, olives, bread, and, of course, a wide array of desserts. One of the things I loved about these dinners was that I could eat whatever I wanted, and skip what I didn't. At home, my parents demanded that we eat everything on the plate, no matter how disgusting it was. At Granny's holiday table, serving dishes were passed around and everyone chose freely. I still remember those meals fondly, and have used my memories as inspiration to cook. I once commented to my mother that canned peas make me smile because they remind me of Granny's cooking. "She didn't serve canned peas," my mother said. "I remember them clearly," I told her. Mom explained that Granny went to all the trouble of buying fresh peas and shelling them by hand. Then she cooked them the same way everyone in her family had always cooked them, which meant boiling them until they may as well have come out of a can. It seems a little crazy now, going to all that trouble to make fresh vegetables un-fresh, but it was the style of a particular time and place. Today I eat most of my vegetables steamed, roasted, or raw. But now and then I encounter some boiled or canned peas, and I eat them with a smile, feeling just a little bit like a kid at Granny's holiday table.